Throughout most of history ordinary people have not joined armies and navies willingly, much less joined up to fight their rulers’ wars, wars that had no rhyme nor reason for them. In feudal times ordinary folk were obliged by their lords to follow them to war. More recently, for example in the First World War, when whipping up patriotic fervour didn’t suffice to produce enough cannon-fodder (and it didn’t) people were conscripted – which just means being forced to go and fight. Another handy tactic employed for centuries in England was ‘impressment’. 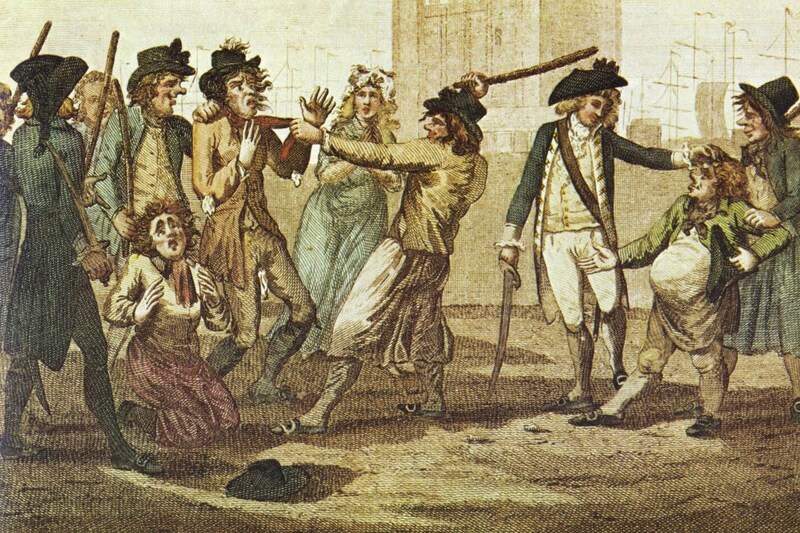 The Royal Navy paid groups of armed thugs – called Press Gangs – to roam the streets and seize ordinary citizens (often but not always sailors) against their will, and usually fiercely resisted, and carry them off like convicts to serve as ‘Tars’ in vile and dangerous conditions in His Majesty’s Navy. If they ever made it home alive they could easily find themselves impressed yet again. By 1793 seventy-five percent of the crews of British vessels consisted of prisoners of war, convicts and those forced into service. Of course the English people resisted such tyranny, as they always have, but to little effect. But that’s another story. Oh! mark their deep dejection. To be but mere delusion. Is this your proof of British rights? Yet doom those Tars to slavery. The prey of bitter anguish. Are in a workhouse ended! Do We Still Need Sin-Eaters?